Cows aren’t the only animals on the move this time of year. Greater sage grouse gather in open patches of sagebrush, known as leks, where the male birds perform their noisy strutting display to attract female mates. Afterward, the birds disperse into nearby wetter meadows to nest and hatch their chicks. In winter, the birds find sheltered draws where they survive eating sagebrush leaves. Greater sage grouse follow that annual routine in 11 Western states on more than 78 million acres. But the species has declined by 45 to 80 percent in recent decades due to sagebrush loss and fragmentation caused by overgrazing, subdivision and sprawl, booming energy development, and other factors, such as predation and disease. The U.S. Fish and Wildlife Service is now considering the grouse to be listed under the Endangered Species Act. Such a move could hinder ranching, oil and gas drilling, and wind and solar energy across the American West, potentially costing up to $5.6 billion in annual economic activity and up to $262 million in annual state and local revenue. Rancher T. Wright Dickinson isn’t interested in federal mandates. 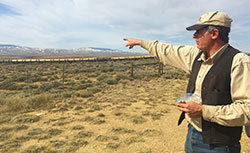 Instead, he is backing a novel approach to conservation through a so-called “sagebrush marketplace.” The Colorado Habitat Exchange aims to help sage grouse by allowing energy companies and developers that unavoidably fragment or degrade grouse habitat to purchase “credits” from landowners, such as Dickinson, to mitigate, or offset, their impacts. In return, the landowners agree to protect and restore critical wintering, breeding, and nesting grounds for the bird.